The global LED driver market for lighting is expected to reach USD 24.98 Billion by 2022, at a CAGR of 26.3% between 2016 and 2022. Growing adoption of LED lighting in general lighting applications, increasing demand for energy-efficient lighting systems, integration of IoT and lighting, and acceptance of standard protocols for lighting control are driving the growth of this market. The base year considered for this report is 2015, and the forecast period for the market has been considered for the period between 2016 and 2022. This report covers the major segments of the market, namely, driving method (constant current LED driver and constant voltage LED driver), luminaire type (A-type, T-lamps, reflectors, decorative lamps, integral LED modules), end-user application (commercial lighting, industrial lighting, residential lighting, outdoor & traffic lighting and others), and geography. 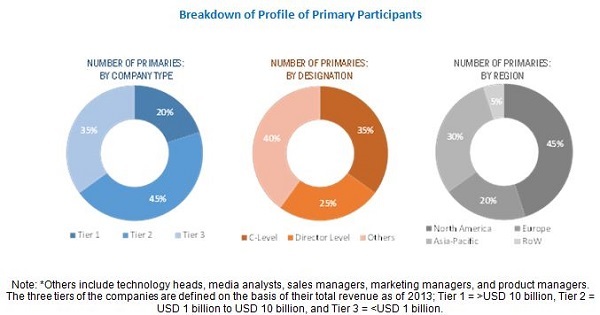 The market size estimations for these segments are provided in this report, along with the key trends and market dynamics related to these segments. The LED driver ecosystem comprises hardware component manufacturers, prototype designers, and original equipment manufacturers (OEMs); LED driver module providers such as Osram GmbH (Germany), and Harvard Engineering (U.K.); LED driver IC providers such as, Texas Instruments (U.S.), Maxim Integrated (U.S.), and Macroblock, Inc. (Taiwan) among others. The report provides the competitive landscape of key players, including their growth strategies to enhance their position in the LED driver market for lighting. The report also provides the profiles of the key companies in the LED driver market for lighting including Osram GmbH (Germany), Harvard Engineering (U.K.), Texas Instruments (U.S.), Maxim Integrated (U.S.), Macroblock Inc. (Taiwan), Atmel Corporation (U.S.), General Electric (U.S.), Cree, Inc. (U.S.), ROHM Semiconductors (Japan), ON Semiconductor (U.S.), and AC Electronics (U.S.). Constant current LED drivers are expected to be the dominant LED driver by driving method during the forecasted period. The reason for the dominance of constant current LED drivers over constant voltage LED drivers is because they avoid violating the maximum current specified for the LEDs, therefore, avoiding burnout/thermal runaway. The market for LED drivers segmented on the basis of luminaire type is expected to be dominated by Type-A lamps. Lamps with integrated modules are expected to witness the fastest growth as fully integrated modules inside an LED system are preferred over conventionally assembled LED systems for the end users as it helps in cost cutting. Outdoor & traffic lighting is expected to lead the end-user application of the LED driver market. Every lighting control project in street lights requires specific solutions that are apt for the road. As different types of roads such as streets, main roads, and highways need different control strategies, many projects need multiple solutions to take full advantage of energy savings. 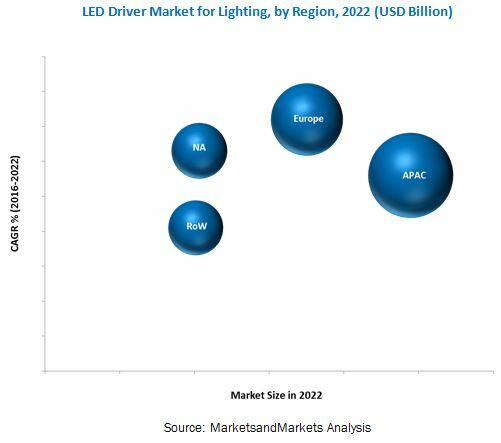 Europe held the second-largest share of the LED driver market for lighting in 2015, while the market in APAC is expected to be the largest as well as is estimated to grow at the highest CAGR during the forecast period. This growth of the market in APAC can be attributed to the greater demand for energy saving lighting systems and a growing population. The LED driver market for lighting in APAC is at the developing stage and the ongoing development in this region makes it a lucrative and high-potential market. Lack of awareness regarding installation of LED drivers for lighting and lack of common standards among various manufacturers are the major restraints for the growth of this market. The major players in the market are Osram GmbH (Germany), Harvard Engineering (U.K.), Texas Instruments (U.S.), Maxim Integrated (U.S.), Macroblock, Inc. (Taiwan), and others. These players adopted various strategies such as new product developments, mergers, partnerships, collaborations, and business expansions to boost their revenue in the LED driver market for lighting.